Ascend high into the mountains and climb up the front stairs of Stairway to Heaven where your vacation will reach a whole new level. 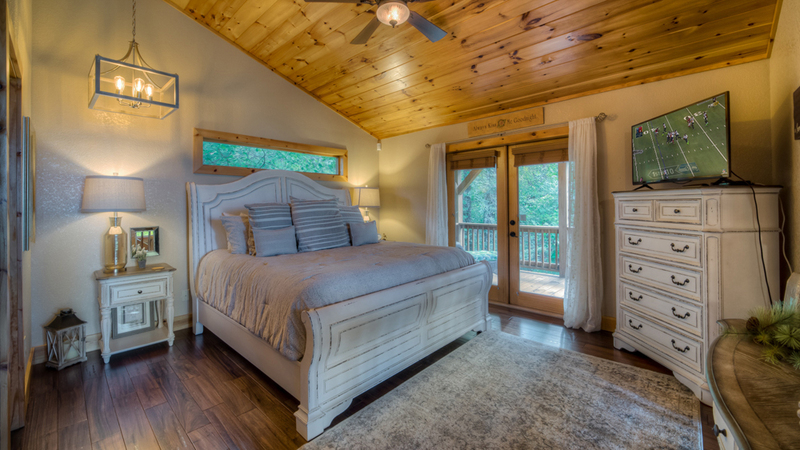 This perfectly-appointed two-bedroom cottage is a truly romantic getaway with custom touches throughout. 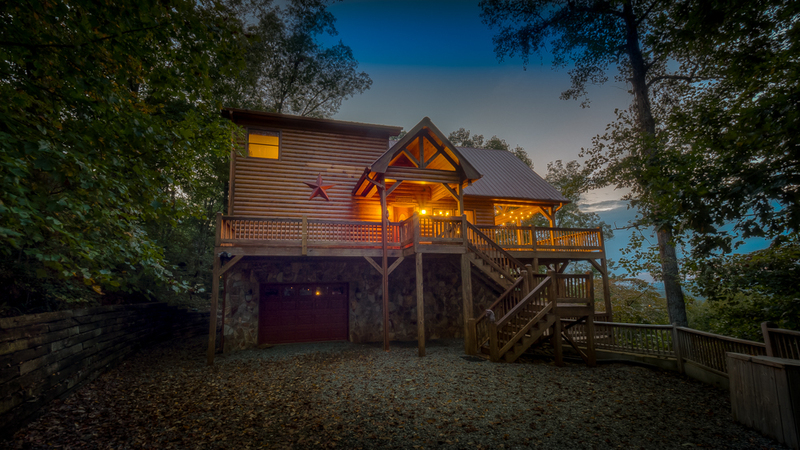 The home's private ambiance belies its treasured location in My Mountain community and its easy 15 minute proximity to downtown Blue Ridge. 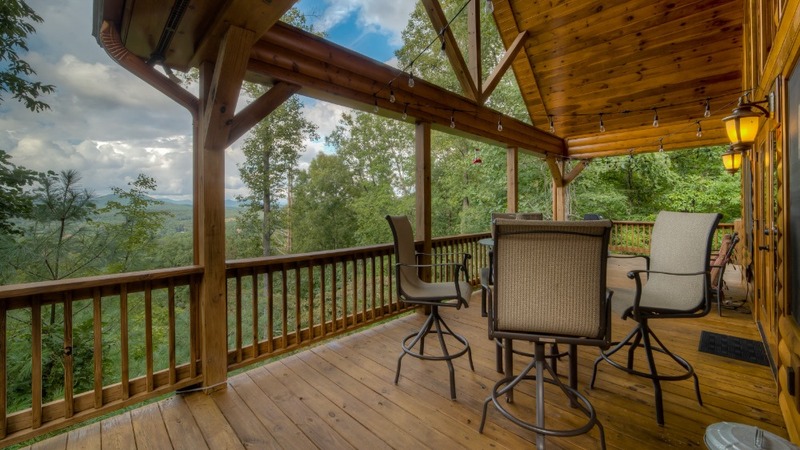 Stairway to Heaven's dramatic wall of glass will draw you out toward the amazing covered deck overlooking spectacular mountain and pastoral views. You'll feel torn about where to spend your time — out on the deck relaxing at the dining table and eating al fresco or back inside where the home's unbelievable touches draw you in for restful luxuriating. Each step you take discovering the cabin will exceed your expectations. A cozy living room is the perfect spot to unwind in front of the wood burning fireplace. 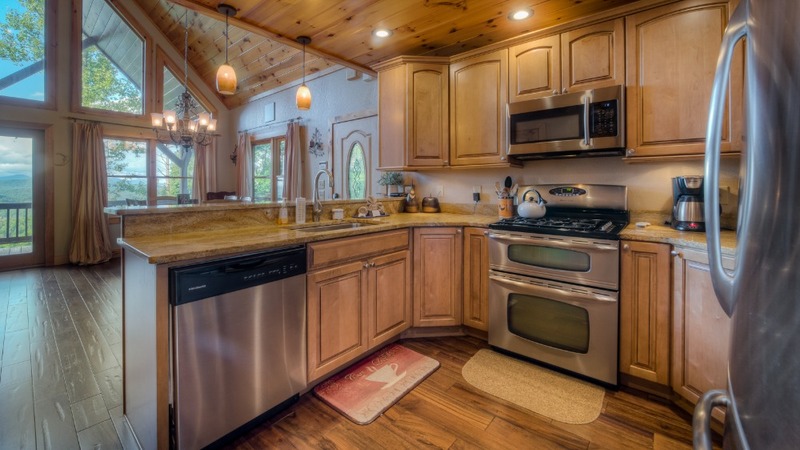 Gorgeous maple cabinets and unique granite countertops anchor the well-equipped kitchen. An inviting main floor bedroom offers a queen bed with affectionately chosen furnishings and dreamy touches to bring the romance to light. 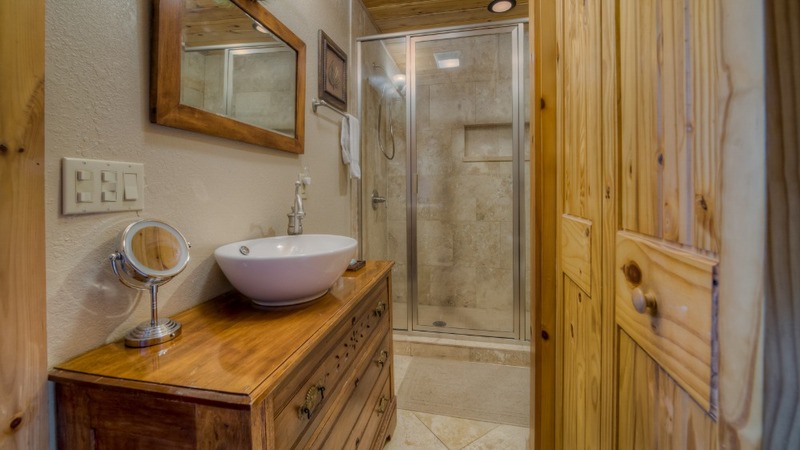 Adjoining this gorgeous room is a spectacular bathroom with heated tiled travertine floors and a walk-in travertine shower. The upstairs master is decoration eye candy. 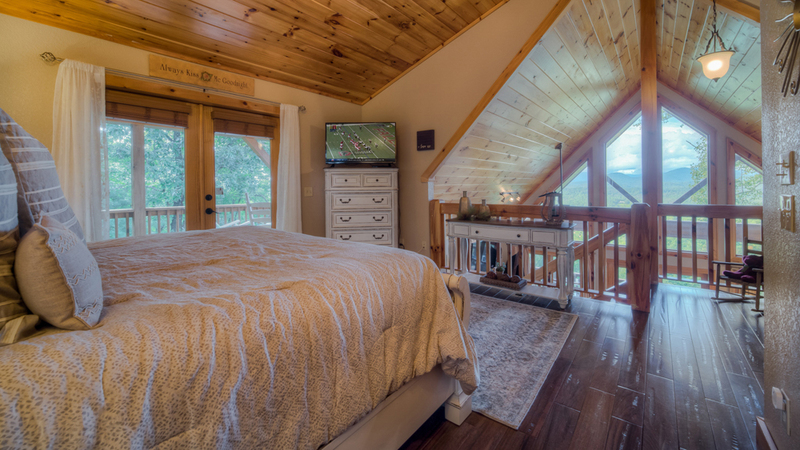 A loft-style room overlooking the gorgeous views, it has a king bed, lovely lighting and cushy area rug. 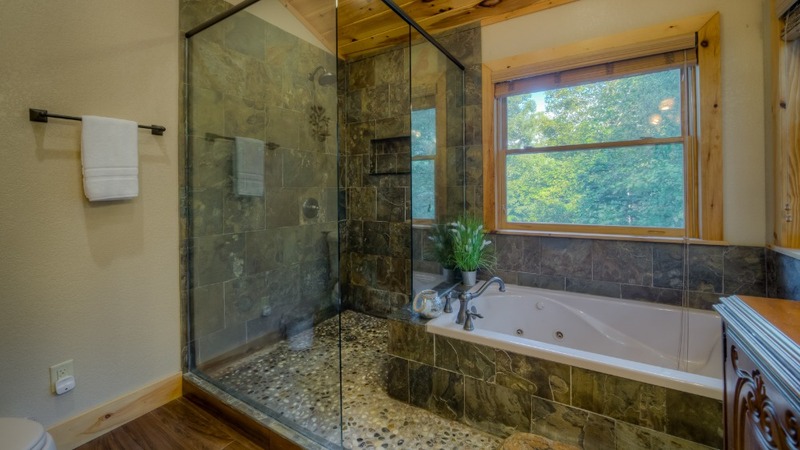 Its Zen-like master bath is designed with natural tile and stone and with high-end finishes, it achieves the perfect balance of beauty and function. Stairway to Heaven would not be complete without a beautiful round hot tub built for five overlooking the spectacular mountain ranges. Let the romance continue down a lighted tiki-torch path leading to your late night snuggle in front of the fire pit. 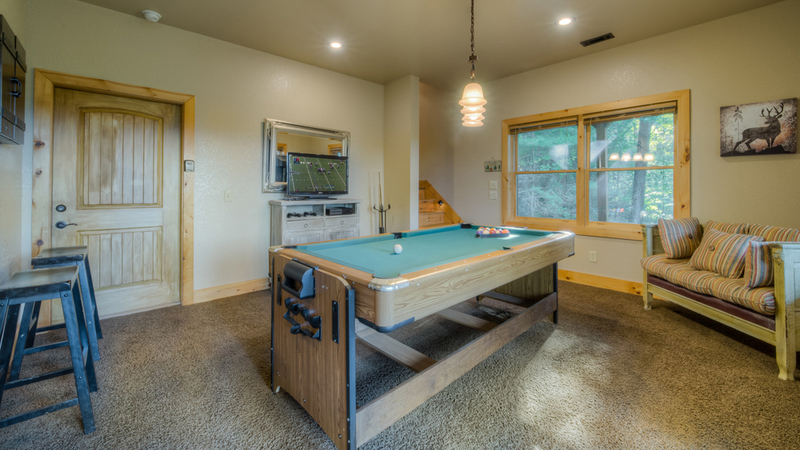 However, if you want to turn up the competitive heat, challenge your partner to a game of billiards or perhaps Xbox in the downstairs game room. Whatever your desire, Stairway to Heaven has it all. 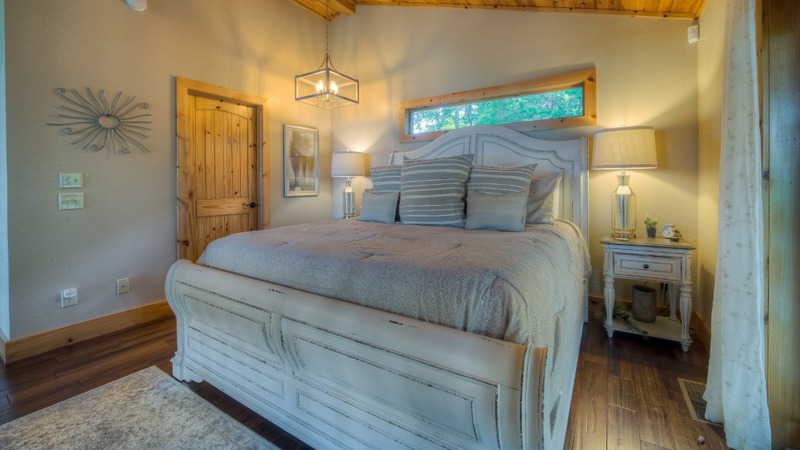 This custom home with true luxury fineries will keep your romantic getaway on Cloud Nine. 03/19 - Great view and very nice cabin. Very friendly to work with. 01/19 - This was the best cabin ever. We can't wait to come back. Great service. Very responsive to needs and emails. 01/19 - We stayed in Stairway to Heaven and it was immaculate, so beautifully decorated. We are already looking at when we can come back! Excellent company to deal with and you always put the customer first! 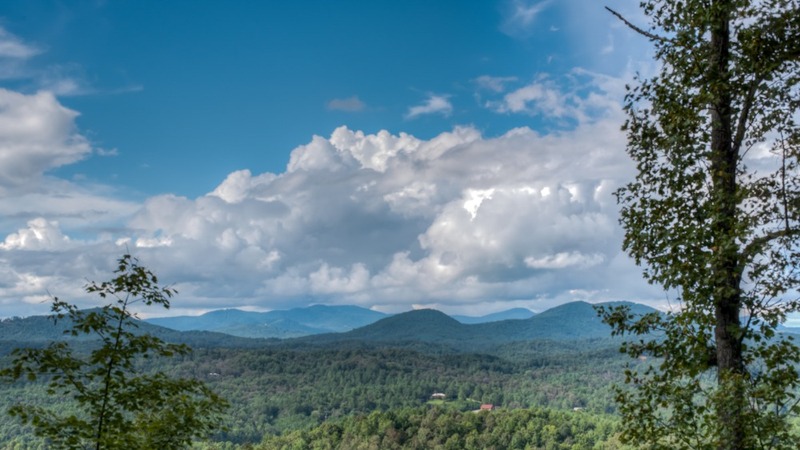 01/19 - Beautiful view, we were concerned with the Morganton proximity to Blue Ridge, but the location was perfect - just a quick 5-10 minute drive to town. The house and amenities exceeded our expectations. Great job! 12/18 - The loft floor plan was stunning. 5 stars! 12/18 - It was very homey and had everything we needed! The little extras were a great touch Friendly, personable staff. 11/18 - Loved the finish and furnishings and especially the view. Like the paved road and convenient access to Blue Ridge. 10/18 - Excellent amenities and courteous staff. 09/18 - Liked the floor plan, amenities, view. I enjoyed working with the company. 07/18 - Love the layout & fantastic mountain views. I enjoyed dealing with your company, as your staff was friendly & professional. 06/18 - Enjoyed the view, seclusion and the layout.The staff were nice and friendly. 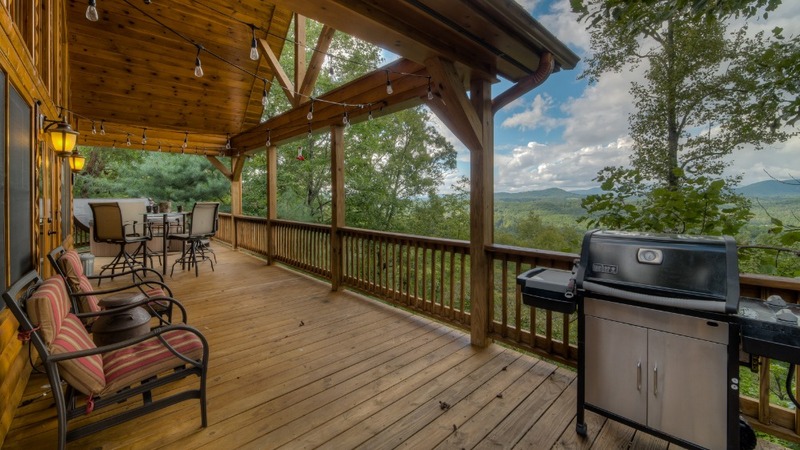 07/18 - Our favorite features of the home were the hot tub, grill, kitchen, scenery, location and the price. Would highly recommend Escape to Blue Ridge. 4/18 - Layout of the home was great. Bathrooms were fantastic. Hot tub and deck were great with a good view. 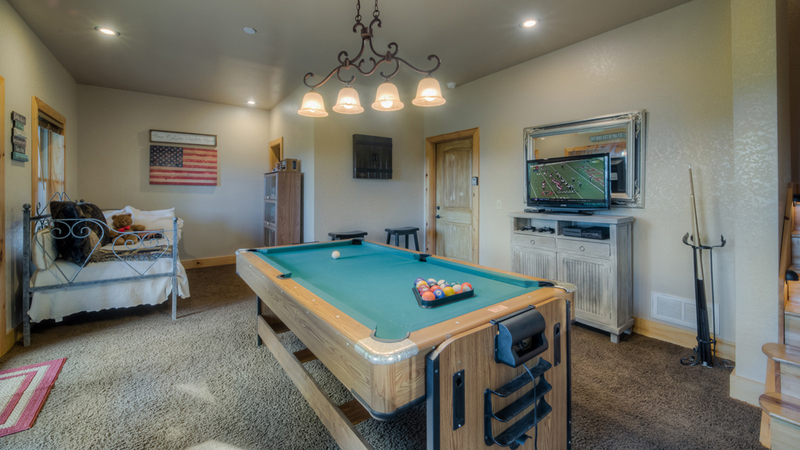 Well stocked for kitchen, games, amenities. Love working with you guys every time. 3/18 - Loved the fireplace and the view. The cabin was beautiful. Everyone I interacted with was very friendly and courteous. We enjoyed our stay very much. Loved the town and people and I think it speaks volumes as to the company as a whole to base your company in this area. 10/17- Peaceful and quiet. Nice mountain view. The staff made it very easy to rent the cabin and were quick to respond. 08/17- The view was amazing!! The cabin exceeded our expectations. 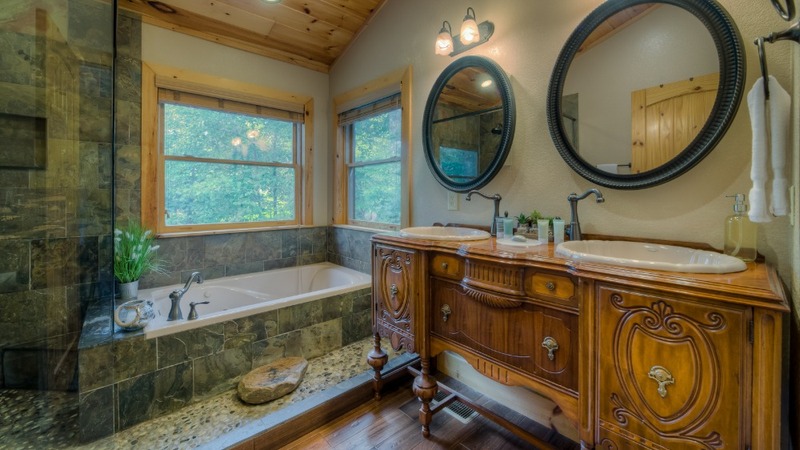 Gorgeous decor and bathrooms. The company is amazing and I cannot wait to use again next year. Hoping to bring a big group of other families as well to rent as they were all jealous and in awe of my photos. 07/17- This home was over the top! The pictures online are amazing but truly it was even more beautiful in person! Truly top notch, clean, inviting, and very homey! It was decorated with class and we felt at home the moment we walked in! Escape to Blue Ridge was very professional, prompt and friendly from the very beginning. I sent numerous emails with various questions and they were always returned promptly and with all my questions answered. I called once we arrived with a few questions and received a prompt call in return. Very satisfied and would HIGHLY recommend to others. 07/17- Relaxing home. Great first experience. 06/17- Beautiful view. Clean and functional. Very comfortable. Overall impression is very good. Everyone was accommodating and the property was nice. 06/17- Our favorite features of the home were the view and the hot tub. Absolutely incredible. 04/17- We loved the beauty of the location. Your company seems very efficient and I enjoyed working with you. 02/17- Nice view, very clean and well equipped. Perfect for me and my wife. I like the company and I like your properties. 02/17- The view is awesome, everything was there that we needed, everyone that we talked to was very nice. It was just a really relaxing and peaceful place to stay. I was very impressed with the company. I only talked to them a few times and was very impressed with how nice they were and efficient. Everything was there that I needed. You could tell that everything is kept up there at the house. 01/17- The house was beautiful and perfect for the dogs. 01/17- The view is incredible, very peaceful. Very professional company. 12/16- The cabin felt like home away from home! A well maintained home is always a plus for me. Professional company. 12/16- The home is a great home. 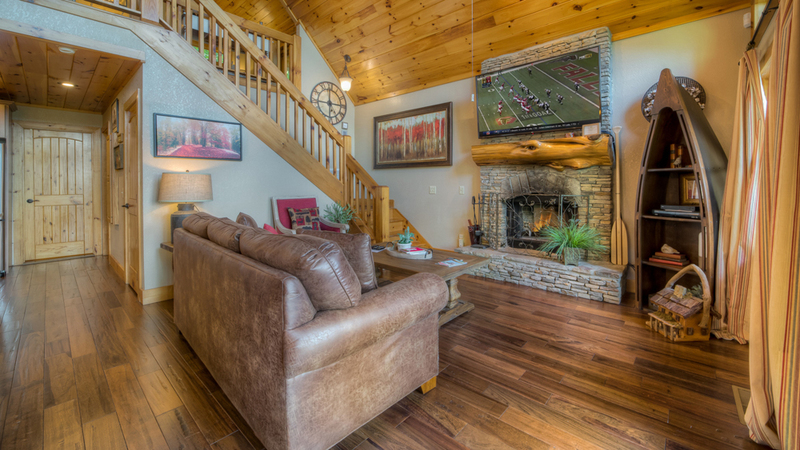 We have stayed in your cabins for years and always recommended them to others. 11/16- The atmosphere was great and the view was impressive. There were a lot of amenities. The company is great. 10/16- We loved the view, the accommodations, how well stocked the kitchen was and the amenities in the cabin. Very courteous and friendly staff. 09/16- Home was super clean for us when we arrived, and the view was fabulous! Wonderful company! 09/16- The mountain view from this cabin was breathtaking. Both bathrooms are very nice and unique. We've been using ETBR for years and will continue to do so. 08/16- Loved the kitchen and the bathrooms and most of all the view! 07/16- This was a great getaway for my husband and I for our anniversary and his birthday. 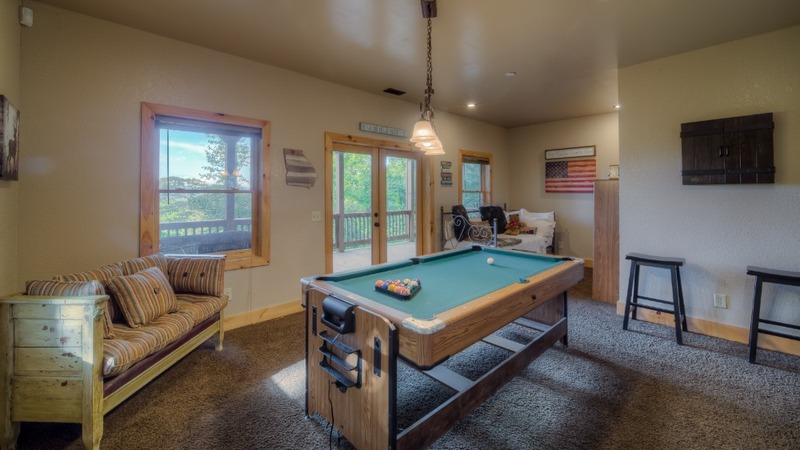 The views, hot tub, and pool table were what we enjoyed the most. The kitchen utensils and appliances were in great supply. 06/16- We loved the gas stove, gas grill, and outdoor dining area. the beds were comfortable. The location is convenient but feels very remote. 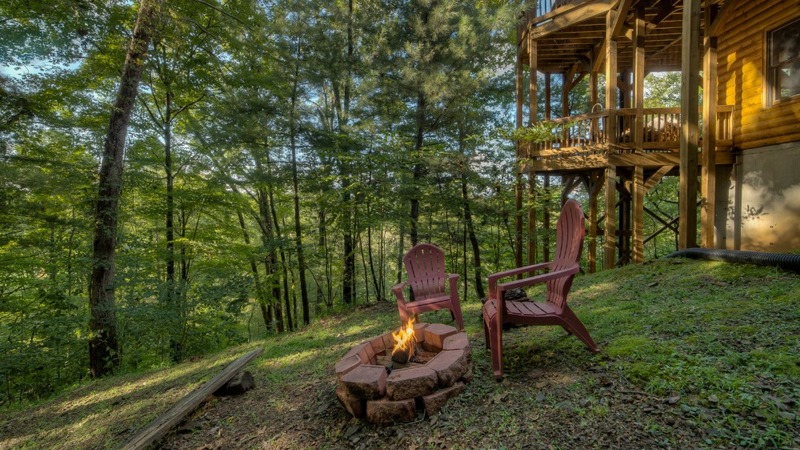 We love renting from Escape to Blue Ridge. You guys are always extremely responsive and make the whole process as easy as possible. 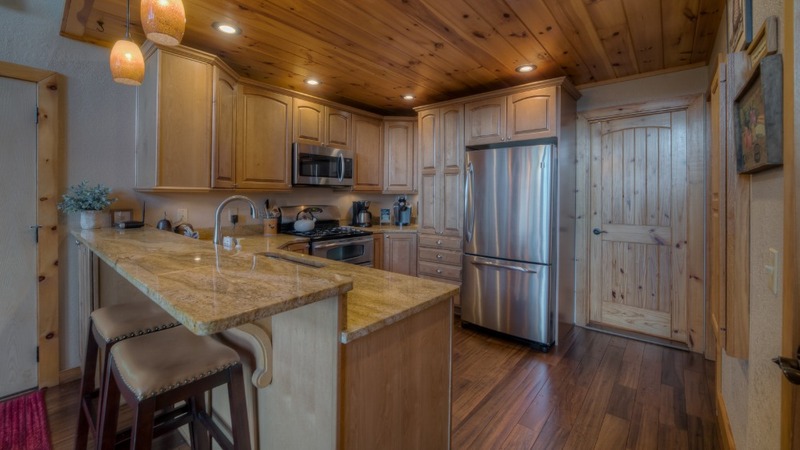 You also have consistently clean and well kept cabins. 06/16- This is our second visit to this cabin. 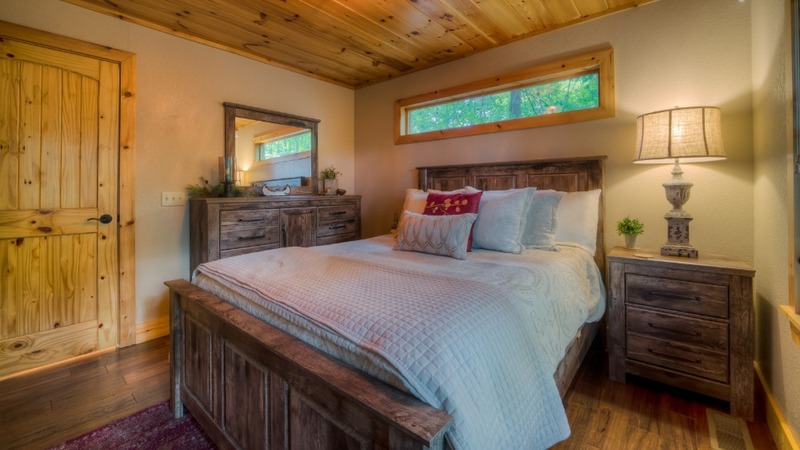 We love the intimacy for just 2 people and being able to see the countryside from our bed. We also really love having a balcony in our bedroom. The upstairs bathroom is heavenly. 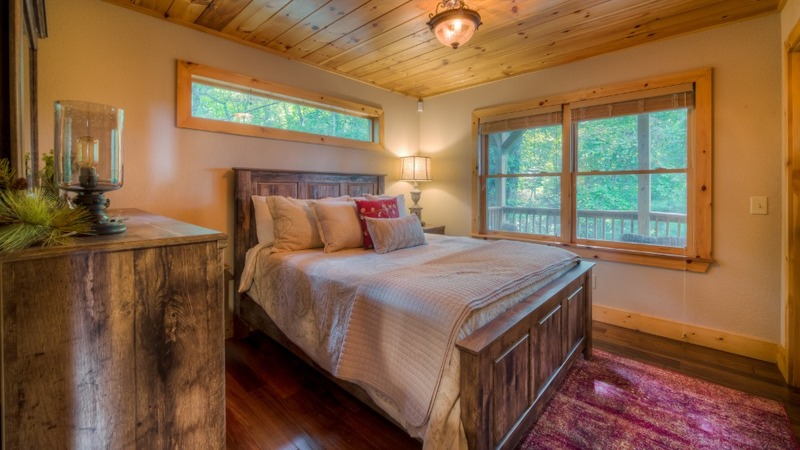 The theme of the cabin is so nice and romantic. We love doing business with ETBR. We have rented from you several times now. 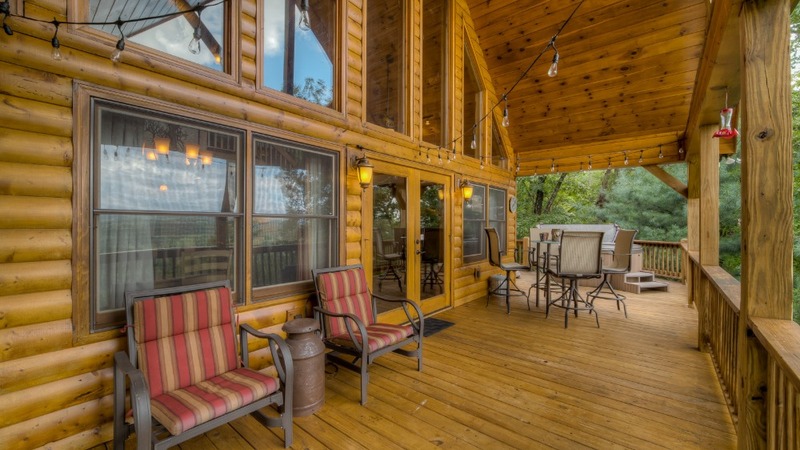 We can always be assured of a tasteful, better than average cabin with all the amenities we want. 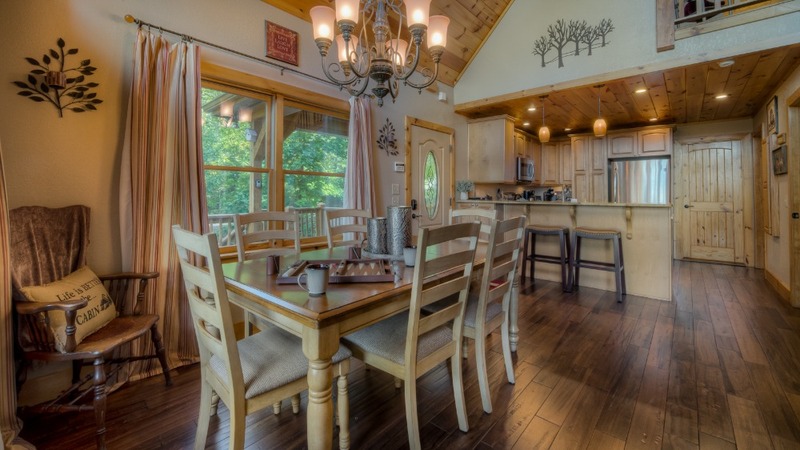 The decor is in no way overdone as I see in lots of cabin photos from other places. The cabin is clean, in very good condition, and we have not yet had a problem with any of the places (aside from a hot tub that was leaking once). Thank you for helping to give us these memorable vacations. 05/16- The home is well keep and well thought out. 05/16- The view was great and the peace and quiet was serene. 03/16- The view was perfect and we enjoyed hanging out in the living room at the end of our busy days exploring. We especially appreciated the binder full of helpful information. 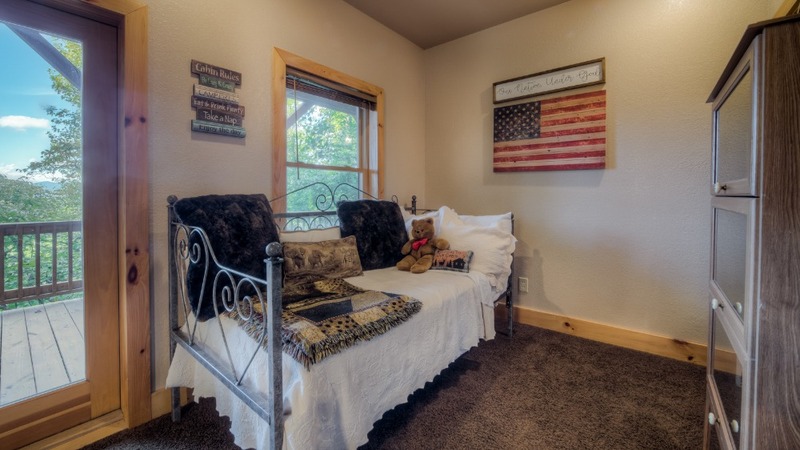 Your home choices were beautiful and from our experience with this one rental, true to their descriptions. We look forward to visiting again and would not hesitate to view EBR's offerings for consideration! 03/16- I enjoyed the whole home. From pulling up to the entire interior. This home was wonderful, and I felt at home. This company is a great company to do business with. 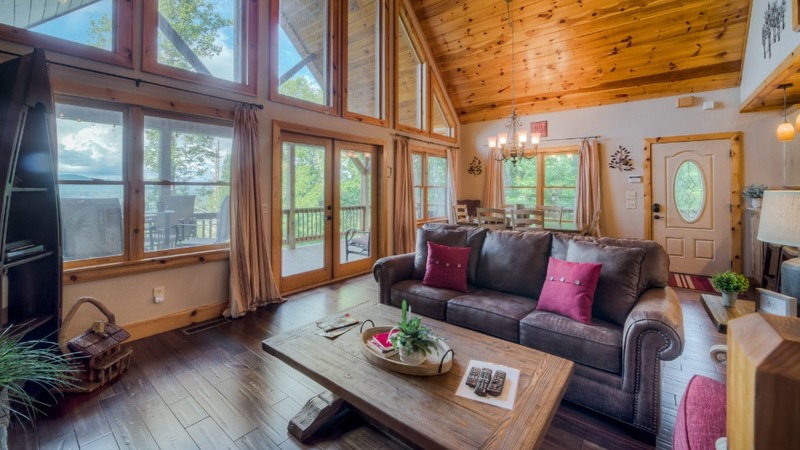 02/16- Great cabin for a family or as a romantic getaway. Great company that was very helpful! 02/16- Amazing views! 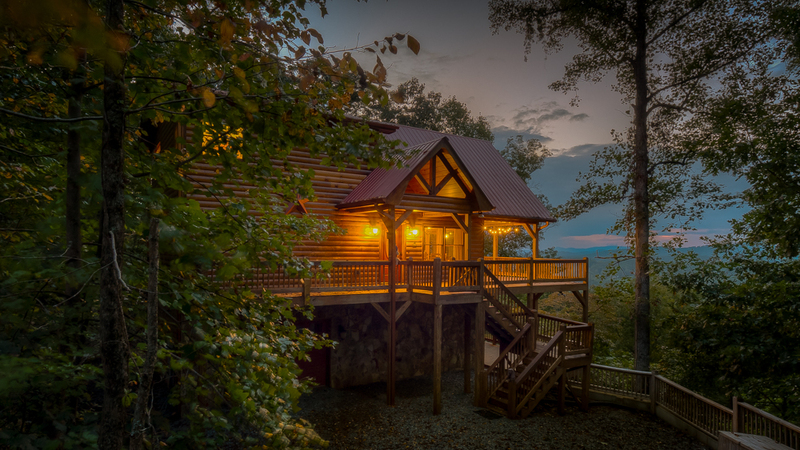 We have always enjoyed our times in Escape to Blue Ridge cabins. 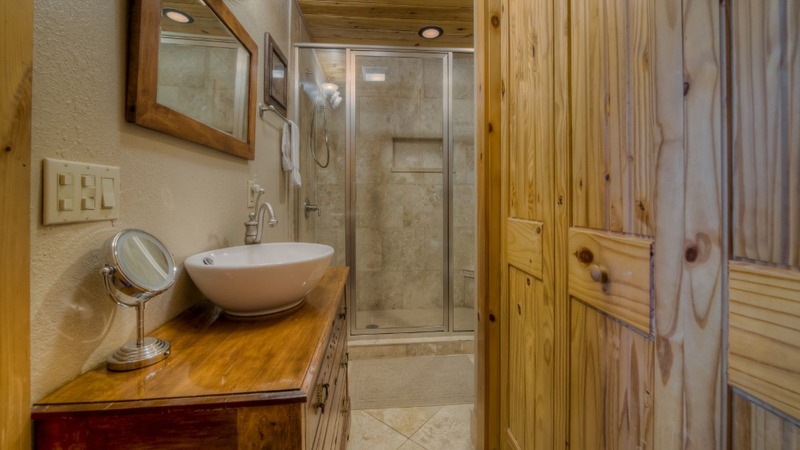 02/16- I enjoyed the back porch and my boyfriend enjoyed the jacuzzi in the master bathroom. I was very impressed with the staff, we got lost on the way up and was easily guided in by one of the reps at guest services. Once we left out it had snowed and we were unable to make it up one of the hills the staff was nice and told us to wait 4 more hours and the snow should be melted by then. We went back to the cabin and got a chance to enjoy the outside jacuzzi while we waited to check out again. 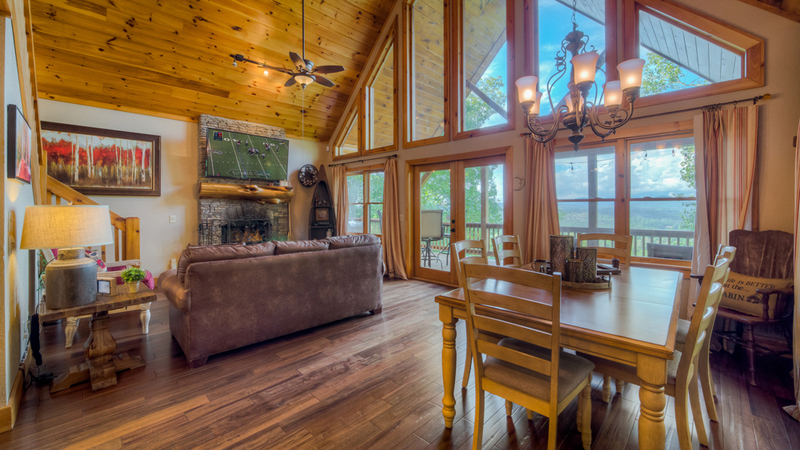 01/16- It is a beautiful home and has incredible views! The hot tub on the balcony is perfect. 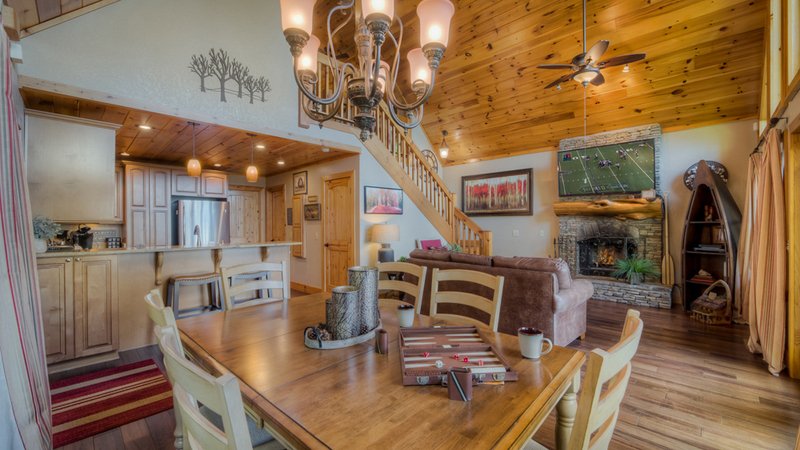 The cabin rental process is very easy and the people on the phone are great to work with. 11/15- To be honest, there wasn't one specific thing because every bit of everything was enjoyable! 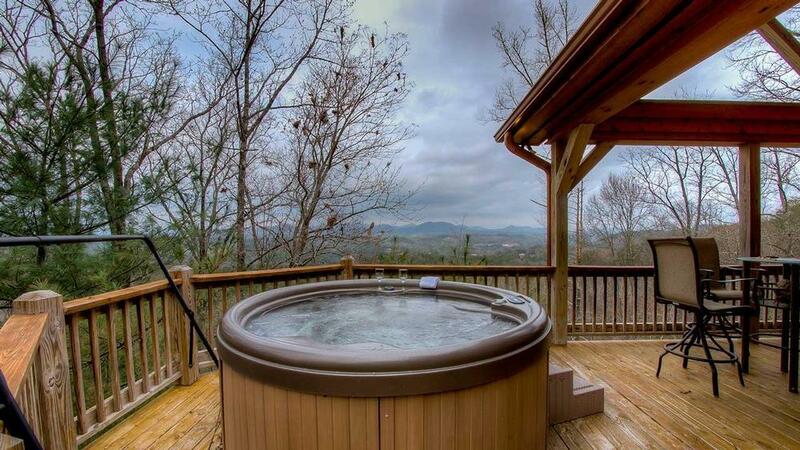 The perfect location for a hot tub overlooking breathtaking views, the tasteful decorating & cozy appeal that made you feel like you were in your home away from home. It all exuded such an air of tranquility. 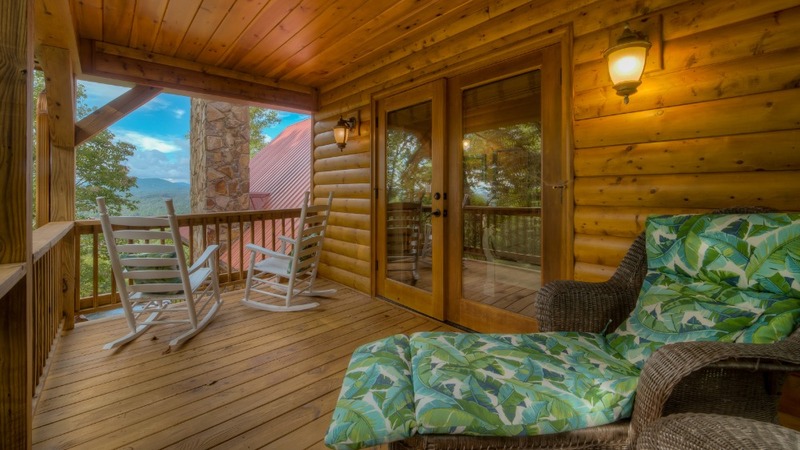 Escape to Blue Ridge was both professional and pleasant to deal with from start to finish. From the moment we made our reservations up until our time of check out. It was truly a wonderful experience that we will definitely be doing again in the future! 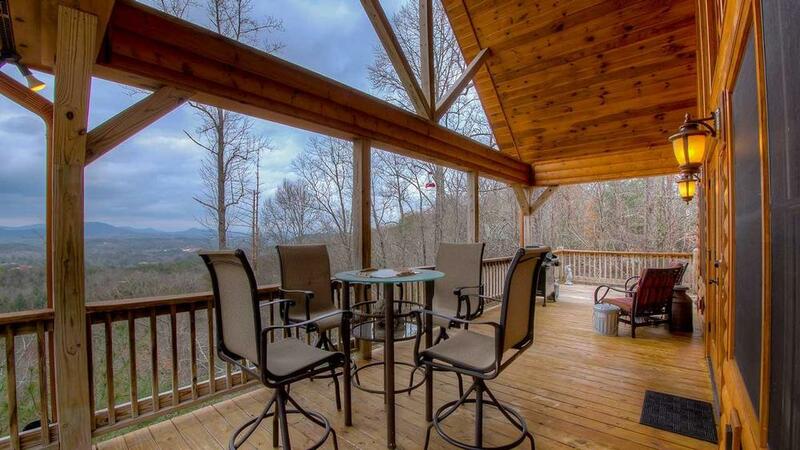 11/15- Excellent location, great views thru large mountainside windows. 10/15- Can\'t say there was anything. Very disappointed overall. Spent way to much time cleaning after paying $115.00 cleaning fee. 09/15- The amenities, the cleanliness , the view were all fabulous! 08/15- The views were spectacular the house was gorgeous and clean. We had a fantastic time. Your company was fantastic you made it so easy for us to book and pay for the cabin. Even though we were booking from England. 07/15- We loved the view. We had a wonderful experience and hopefully will use your company again. 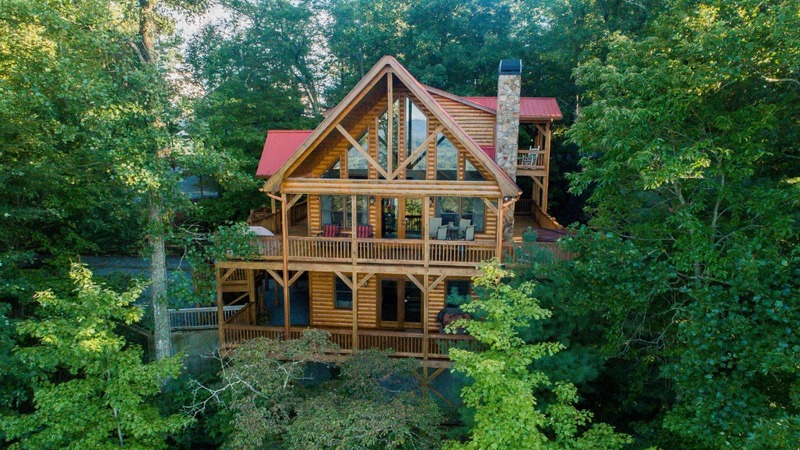 07/15- Beautiful cabin with great views., The main deck is huge and very nice for the dogs.There is a gate at the stairs so they could wander and lay on the deck without concerns of them running off. Kitchen is nicely equipped. Lots of games in closet plus the pool table in the lower level was good since It poured down raining the entire time we were there, Our fishing trip was canceled. All water activities were out because of the heavy rains and flash flood warnings. Very nice cabin but the weather restricited us from enjoying the area. 05/15- The wrap around porch was great since we had two dogs with us. 01/15- The views. The covered deck. Cozy from a size perspective. Firewood being provided. The personal touches (emails, care package, etc) from Escape To Blue Ridge was impressive. 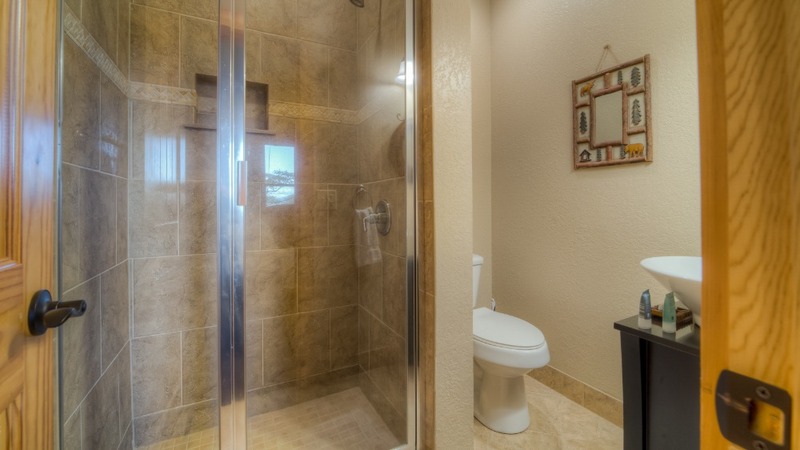 11/14- Bathrooms were our favorite features! Very relaxing, easy to find! 10/14- View, hot tub and everything was good. 10/14- Loved everything! This home is perfect in every way! I love Blue Ridge and plan on making it one of our annual vacations! 09/14- The loft, the porch, the master bathroom, location, view,upkeep of the personal and surrounding grounds were all great. Would love to live there! 08/14- The master bedroom w/ the front porch view of the mountains w/ the hummingbirds of the front deck. I would rate Stairway to Heaven overall a \"B\" with the following comments. First, the view from the deck was spectacular and provided a relaxing time. On the flip side two of the three \"Jets\" in the Hot Tub were not operating to full capacity which took away some of the enjoyment of being in the Hot Tub. When we first tried to use the Gas Grill, the tank was empty so I had to call customer service and request a replacement tank so we could cook-out. The response was quick and a replacement tank was delivered to the cabin within 45 minutes which was appreciated. The dishwasher leaked from the bottom or base when turned and we had to place towels on the floor to absorb the water leaking from the bottom of the dishwasher. The furniture in the living room is uncomfortable to sit in and should be replaced with more modern and comfortable furniture. The landscaping outside was overgrown with high grass which needed to be mowed, weedeater, or weed-be-gone especially on the gravel driveway area.\r\n\r\nAgain, with some changes Stairway to Heaven could be a great cabin but based on the items noted as well as some other things, I would not reserve Stairway to Heaven again in the future and will not recommend this cabin.\r\n\r\nI enjoy comingf to Blue Ridge and will plan another visit in the fall but will not reserve Stairway to Heaven. 06/18 - The pictures didn’t do this cabin justice. Absolutely breathtaking, clean and cozy. Such a great weekend getaway. Will be back to visit the Stairway to Heaven. The company is easy to work with!